You can make everything fresh and delicious with the OsterPro 1200 Plus versatility and performance. The Food Processor attachment can really get things chopping in the kitchen with slicing and dicing ability too! Versatile attachments make food prep and smoothie creation simple! Includes 5-cup BPA-free food processing bowl, stainless steel slicing disk and chopping blade. You can make everything fresh and delicious with the OsterPro 1200 Plus versatility and performance. The Food Processor attachment can really get things chopping in the kitchen with slicing and dicing ability too! 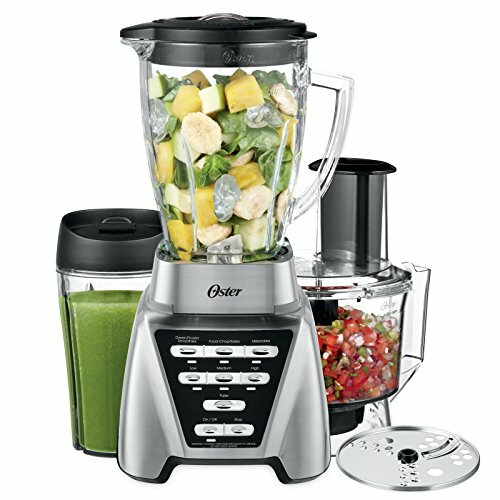 Versatile attachments make food prep and smoothie creation simple! Includes 5-cup BPA-free food processing bowl, stainless steel slicing disk and chopping blade. The powerful motor impresses any chef as it blends through ice, greens, frozen ingredients and more. Starting up with an extra boost at 1200 power watts, it works with blending force to smoothly and continuously create the consistency you need. Smart settings are conveniently programmed to blend the perfect smoothies, salsas and milkshakes in just one touch so you never have to guess how long or what speed to blend your ingredients. The wide base allows foods to flow freely down to the blade and dual direction technology spins the extra wide blade design in forward and reverse motion, optimizing the blade’s power to blend all types of foods.